Male: Grey-brown with horizontal barring on underparts. Female: Larger and browner than male. The Goshawk is a well-built hawk that is widespread but scarce and elusive bird that is usually found in woodlands. They look like a large Sparrowhawk, but in fact the female Goshawk is about the size of a Buzzard and the male Goshawk is slightly bigger than a female Sparrowhawk. Both sexes have close horizontally barred underparts and a broadly barred grey tail. 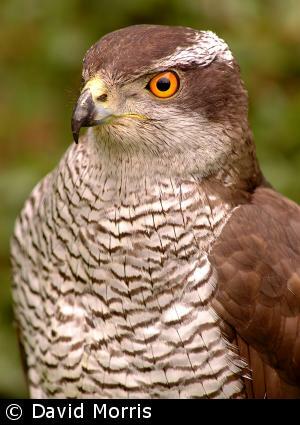 The broad whitish eyebrows (supercilia) and piercing orange-yellow eyes make the Goshawk evil-looking. The cere (flesh at the base of the bill) is greenish-yellow and the legs are yellow. The male (or tercel) is smaller than the female and has a dark patch behind the eye that makes it appear even more fearsome. The female (or falcon) is browner than the male and is the heaviest bird of the genus Accipiter. Juveniles are paler and browner, with teardrop marks on its underparts and greenish eyes. The Goshawk's call is a penetrating shriek, "hi-aa". Their food is mainly medium-sized birds, such as Wood Pigeons, Pheasants and even Kestrels, mammals, such as rabbits and squirrels, and amphibians and reptiles. The attack is usually similar to that of the Sparrowhawk - waiting in cover to launch a surprise attack involving a fast chase over a short distance - but will also dive like a Peregrine. 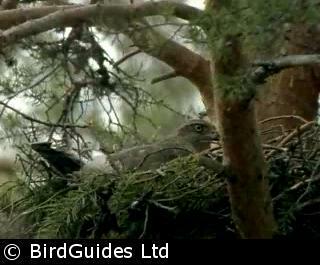 Goshawks nest high up in trees and it is the male that does the building. The nest is an untidy construction of twigs lined with bark. The eggs are about 59 mm by 44 mm, smooth and non-glossy, and pale bluish-white. Incubation is by the female only. Both adults feed the young birds, though the newly-hatched are usually fed by the female with the male hunting and bringing the food to the nest. Apart from juveniles dispersing from their natal sites in late summer, Goshawks are sedentary. The Goshawk is slowly expanding its range, helped by management of forests, but despite being specially protected throughout the year it remains one of our most persecuted birds of prey.